Drink driving is dangerous and no one should do it. But if you are tempted to get behind the wheel after a few drinks, this invention should stop you from making a terrible mistake. Anyone thinking of driving once they've had a few wants to take a long hard look at themselves. Thankfully, these kinds of miscreants could soon be banished from our roads thanks to this in-car system that blocks booze hounds from taking the wheel. 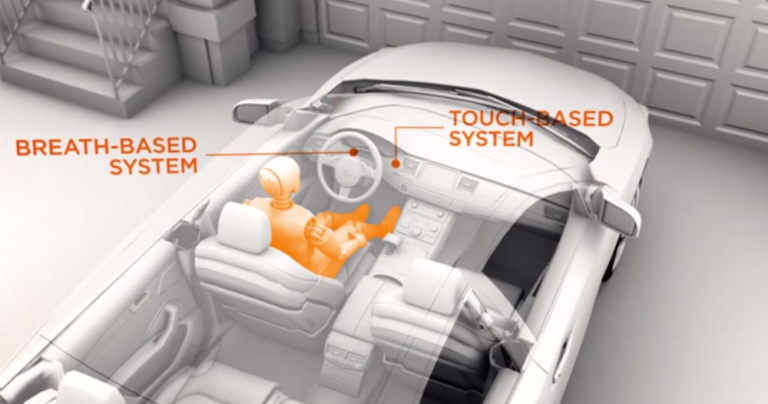 It's called the Driver Alcohol Detection System for Safety, or DADSS for short, Autoblog reports. It's a joint venture from the National Highway Traffic Safety Administration (NHTSA), safety advocates and motor industry representatives, and it aims to reduce and hopefully eliminate the number of deaths on the road. Here's how it works. As soon as you get in, you're faced with a steering-mounted breathalyser. Blow into it, and it'll detect your blood alcohol level (BAC). This is backed up by the ignition button that uses infrared light to scan underneath the driver's finger to determine their BAC. If it's too high, the engine won't start and it's the bus for you. Bad luck, boozy. It takes less than a second to measure the BAC, so it won't delay you. And the minor inconvenience is a small price to pay for safer roads. That would require all cars being fitted with it, however, and there's a slim chance that will ever happen. The NHTSA has no plans to make it mandatory, but would like it to be available to order on new vehicles in the future. No doubt the Clarkson brigade would cry health and safety gone mad and try and have it banned. It's already met some resistance in the US from the American Beverage Institute. They claim everyone processes alcohol at different rates, so what impairs one person could have no effect on someone else's driving. But then following that logic, shouldn't the drink drive limit be banned too? Anyway, this may all be academic, as the NHTSA reckons the system won't be implemented for another five years, by which time Google reckons its self-driving cars will have hit the road. They would do away with the need for a driver, and hence the problem of drink driving. But until then this seems the best idea anyone's come up with.